Financial exploitation of the elderly and disabled is a crime. It costs millions of dollars nationwide and destroys thousands of Missouri lives. The Missouri Department of Health and Senior Services (DHSS) has launched a program called MOSAFE-- Missourians Stopping Adult Financial Exploitation--to combat it. Financial exploitation occurs when someone illegally uses another person’s money or property for profit or gain. MOSAFE educates financial institutions and you, as a consumer, on how to stop attempted or ongoing financial exploitation before a senior or disabled adult’s funds are depleted. 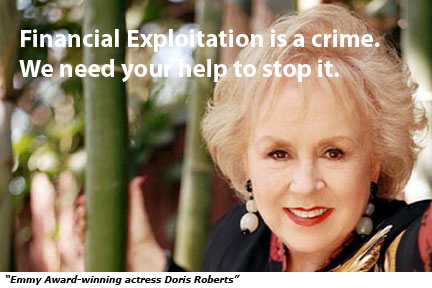 Emmy Award-winning actress Doris Roberts, best known for her role as nosy Marie Barone in TV’s Everybody Loves Raymond, narrates a video about how to stop this fast-growing crime. The video, consumer brochure and informative slide show will help consumers, the general public, and other professionals learn how to recognize and report financial exploitation. The materials can be viewed and/or downloaded from this site. MOSAFE also provides a training kit to financial institutions and their employees on how to recognize and report this crime. The kit includes a video, brochure, PowerPoint presentation, resource manual and eight articles, which can also be viewed and/or downloaded from this site. A copy of the MOSAFE consumer or financial institution training kit may be obtained by completing this order form. If you suspect an elderly or disabled Missourian is being exploited financially, call our toll-free Adult Abuse and Neglect Hotline at 1-800-392-0210. For more information on MOSAFE, please contact the Department of Health and Senior Services via email at info@health.mo.gov or by phone at 573-526-4542. You may also contact the Attorney General's Consumer Protection Hotline, 1-800-392-8222, to report scams and cons of any type, including those that deal with telemarketing, the Internet, e-mail, financing, and home and car repairs. For information regarding investments and fraud protection, or for information regarding a company or representative, visit the Secretary of State’s Missouri Investor Protection Center or call the toll-free investor protection hotline at 1-800-721-7996. The hours for the hotline are Monday through Friday, 8 a.m. to 5 p.m. This project has succeeded through the support of Missouri’s financial associations and Area Agencies on Aging, and AARP. If you suspect an elderly or disabled Missourian is being exploited financially, call our toll-free Adult Abuse and Neglect Hotline at 1-800-392-0210.